The Englishman had been sixth reserve, knowing he must play the European Tour event to enable him to complete the 13 required to keep his Tour card and be available to play in the Ryder Cup. "I found a voucher in a Willy Wonka chocolate bar," said Poulter, 39. "If you wrote it no one would believe the story. I guess it was meant to be." Poulter has been an inspirational figure for Europe in the Ryder Cup, playing in five of the last six events and helping defeat the United States on four occasions. He has won 13 points out of a possible 18 since making his debut in 2004 and is unbeaten in five singles matches. 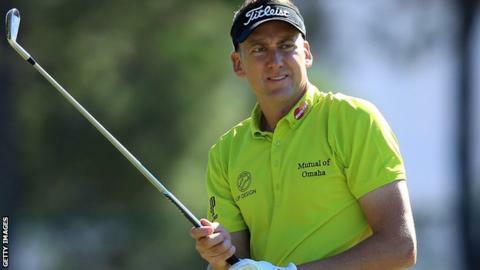 Poulter made a last-minute journey from Florida to compete in the Hong Kong Open two weeks ago to boost his chances of retaining his Tour card after former US PGA champion Rich Beem gave up his place in the field to allow him to take part. He was then sixth reserve for this week's tournament in Shanghai. The first four reserves were drafted in to complete the 78-man field before South Africa's George Coetzee and USA's Brandt Snedeker withdrew, allowing Poulter a reprieve. He finished tied 16th at the Turkish Open on Sunday, which was his 11th European Tour event of the season - and the first of the season-ending Final Series quartet. The WGC in Shanghai will be his 12th and he is also in the field for next week's BMW Masters, also held in Shanghai. The top 60 in the Race to Dubai rankings are then eligible to compete in the DP World Tour Championship in Dubai and Poulter is in 46th place heading into this week's event.